Yesterday, in Washington, DC I awoke to reports of thousands of women and men dancing in India, South Africa, Australia and around the globe in support of One Billion Rising, a public uprising in response to the human rights abuse of violence against women and girls. I saw a video of my friends at Flying Broom, a Turkish women’s organization, dancing in solidarity to support their campaign to end child marriage. And I read hundreds of tweets from people who had or were about to dance to end violence against women. 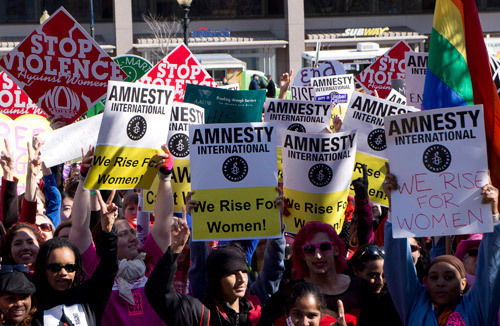 Amnesty International is proud to have joined with One Billion Rising to raise awareness – and to take action – to end violence against women and girls. We danced and raised our voices to stand as one with the estimated one billion women and girls whose lives have been touched by violence. In Washington, DC, Farragut Square quickly filled up at noon with activists, survivors, and students from all corners of the city. We stood as one, we protested as one, and we danced as one. We demanded that the House of Representatives follow the Senate’s lead and pass an inclusive Violence Against Women Act (VAWA) that includes Native American and Alaska Native women, LGBT people and immigrant women. The rally was amazing! Women and men rejoiced in the movements of our bodies, celebrated our coming together to stand up for women’s rights and took action to make change. In Atlanta, Amnesty members gathered on the steps of the Georgia Capital to stand together with civil rights activists Evelyn G. Lowery and Bernice King. They then joined a flash mob with over 2,000 people! In San Francisco, Chicago and even in a small town square in Newburyport, Massachusetts women and men joined the rising and called for an end to the violence. The events of February 14th were powerful. We spoke out, we stood up, and we showed the world that violence against women must stop now. But we rose with a purpose; and that purpose is to hold governments and those who would commit gender-based violence accountable. So ACT now – and with purpose. Tell Congress to reauthorize Violence Against Women Act TODAY! This entry was posted in Amnesty Members, Women's Rights and tagged One Billion Rising, Violence against Women, violence against women act by Cristina Finch. Bookmark the permalink. Congratulations, Amnesty, for doing such a wonderful thing for people who can't help themselves! I don't think boycotting is an option for big serious companies nowadays. This is a very nice way to make a point. I love it when people keep away from violence.